Why is the universe evolving? That is a question that must necessarily arise if we are to even entertain the possibility that there might be any form of consciousness directing the process of evolution. If we see a deterministic universe governed by universal laws there is no reason to speculate as to the “Why?” of the universe. The universe just is. On the other hand if we entertain notions of teleology we must tackle the question of meaning and purpose in the universe. Emerson tackles this question at the end of his essay on Nature by asking, “What is the end sought?” he quickly answers his own question stating, “Plainly to secure the ends of good sense and beauty, from the intrusion of deformity or vulgarity of any kind.” The universe in short is ultimately good. Emerson has a truly optimistic view of progress and evolution. Yet he must contend with the facts. If the universe is an evolutionary process that is heading toward its own most highly perfected form what about all of the suffering in the world? Why is humanity in a current state that was by Emerson’s own admission forces him/her to look up to forms of nature that should be less advanced? We cannot fight against the evolutionary “workman” that is nature, but we can identify ourselves with the work of evolution. If we see ourselves as evolutionary agents then we will find the “soul of the workman (nature) streams through us.” Again Emerson is describing an evolutionary awakening that will surface in the Pragmatism of the next generation of American philosophers and erupt in the 20th century and beyond in myriad forms of evolutionary spirituality. It is very interesting when we start to look at life the way both Emerson and Bergson are describing it. Which is life being seen as a dynamic tension between creating and the created (or the material realm verses “the primitive direction of the original jet” as Bergson described it). It is in these two actions, whose movements are in opposite directions, that Bergson saw the entire evolutionary process unfolding. Bergson describes this inverted movement as “a reality which is making itself in a reality which is unmaking itself.” Very similar to both Emerson’s idea that “Nature keeps her laws, and seems to transcend them” as well as the integral phase by Wilber of “transcend and include”. It is in the ability of living things to make “an effort to raise the drops that are falling” (essentially to transcend it’s own materiality) that Bergson saw that role and purpose of life in the universe. Abstractions that have lost their mooring. Non-sense, but beautifully stated I must admit. Sometimes people try to show that we can get along without consistency. Ralph Waldo Emerson, for example, once wrote that “a foolish consistency is the hobgoblin of little minds,” and some people have claimed that he thereby showed that only narrow thinkers try to be logical. But in fact, a moment’s reflection will suffice to show that you cannot make sense unless you are consistent. Even Emerson had to be consistent. Suppose he really held that you don’t have to be consistent. Then he would have to agree that it is perfectly acceptable to hold also that you do have to be consistent. After all, if consistency isn’t required, then it is fine to hold both (1) “You don’t have to be consistent” and (2) “You have to be consistent.” But this, of course, is meaningless. Logical reasoning, then, is consistent reasoning. You might need to look in a different book. Emerson wasn’t really a philosopher – in fact there weren’t really philosophers at his time (at least not in America yet). Emerson is a corner stone in the creation of American culture – in fact he is often called the father of American culture. He was not a rigorous thinker or a technical thinker. He was however a towering intellect and literary figure. Arguably the most important figure in American literature. (The authors of philosophy text books aren’t necessarily well respected. 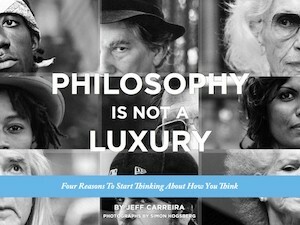 :)) Take a look at “The American Evasion of Philosophy” to get a sense of Emerson’s influence on American philosophy. He was highly revered by William James, Charles Sanders Peirce and John Dewey – that is pretty good company. I would agree with you that his writing is metaphorical speculation and much of it is dated and has been supplanted by a more modern understanding of the world. At the same time it was truly inspired and without a doubt had a tremendous impact on the creation of the American mind. All American’s see the world the way they do in large part because of Emerson’s ideas. If we want to understand the roots of evolutionary philosophy in America and also of the philosophy of Pragamtism we have to go to Emerson. Today I was reading in a book ‘Emersons life in science’ of Walls and there I found that when Emerson traveled for the first time through Europe (visiting Paris museum of Natural history) he had with him a copy of Goethe’s Italienische Reise in which Goethe detailed the goal of his journey, to find the primal or ur-plant, the primitive form that, unfolded, would exhibit the complete “chain of life”. ‘ What it did to Emerson was not the idea of nature’s creative order -that had been since long time familiar to him- but the reality of the idea, the complete chain, offering in material form the keystone that locked the arch of reasoning into place. The effect was catalytic. Emerson could see how to compose not just nature but his own life’s experience and its fragmenting writeen records into a stable but enlessly expansive whole’. After this tour in Europe he started lecturing and these where the basis of his first publication, nature (1936). This was the only thing I read untill now, so I need to find out more what this book is all about, but what I found so fascinating was that also Steiner was deeply influenced by Goethe. If Emerson had a deep influence on the US, Steiner definitely had it on Europe, so Goethe is also one of the root-figures who it is important to look into if we want to get to genuine understanding of this all. I have now a copy of the Italian voyage and will read it during my Portugal voyage soon. I have the same kind of experience as when I found that all recent philosophers talking about evolution based themselves on Whitehead. So I am very curious what to find in Goethe. It is almost difficult to stay now first with Emerson, I think the book I found is very interesting. It says that Emerson is normally seen as a dreamer and a mystic, concerned with the ideals of transcentendentalism rather than the realities of science and technology but that actually he has deep roots into science. Literature is not complete without science, but also ‘no history of science is complete without the role played by writers of literature who helped ot install science int he popular imagination’. Thank you for this. I did read about Emerson’s time in Paris and his experience there, but I had forgotten about it. Goethe was tremendously influential on Emerson, partly through Emerson’s own reading of Goethe and partly because Emerson dear spiritual friend Margaret Fuller was a devotee of Goethe. Emerson was very influenced by Fuller and she by Goethe – you can see it all through Emerson’s spiritual work. I am finally reading Steiner’s Philosophy of Freedom and it is fascinating to see the similarities between Steiner and Emerson – which makes sense because they were both influenced by Goethe. It is so amazing to see how human understanding has been created over time. We can’t really escape the fact that our understanding and the way we see the world is largely constructed of ideas that have been handed to us through history. Its however not deep enough in my eyes. Neither was Nietzsche a troubled nature and Emerson a lighthearted one. They both lived within their time and cultures. And embodied the radical impulse for freedom. in his corresponence with Walt Whitman Emerson revealed some puritanism. His one limitation to embodiment. While Nietzsche tried to give the phenomenology of the great health in “Gay science”. clearly adresing the felt evolution of bodymind too. I see the great wealth as bridge between Emerson and Nietzsche. A space of wordcentric and potentially cosmocentric personal consciousness. Sri Aurobindo could be brought into play too. As current SDi confab in Texas is exploring brains, genes and culture in new ways the full word(s) of life conditions needs to be adressed too. Is it possible to lose evolutionary way? If human Progress is meant, it may be more apt a term. Evolution is a fact of Being and can’t be sidetracked or stymied, it continues to operate, like gravity. I like to see America as a milestone and turning point in the development of evolutionary consciousness. We who espouse human rights, equality for all humans and respect for all Creation and for the belief in Democracy as the way of the future of humanity are the apostles of evolutionary consciousness that are shaping humanity’s potential to be enlightened, the destined omega of humanity.Those who continue to violate sacred human rights are a retro influence retarding that thrust, a breed that will eventually die out, if they are kept from their violent and anti-life attitudes and behaviors.